At the pre-fight press conference for his WBO welterweight title clash with Jeff Horn in Las Vegas on Thursday, challenger Terence Crawford was quick to dismiss comparisons between himself and former eight-division world champion Manny Pacquiao – but there are a number of ways in which the Omaha-native should be looking to emulate the legendary Filipino fighter on Saturday night. “I’m not Manny Pacquiao. I’m bigger. I’m stronger. I’m in my prime, and that’s going to show come Saturday. We’ll see Saturday night who’s getting rocked and dropped. This is what everybody’s been waiting on — for Terence Crawford to move up to 147. 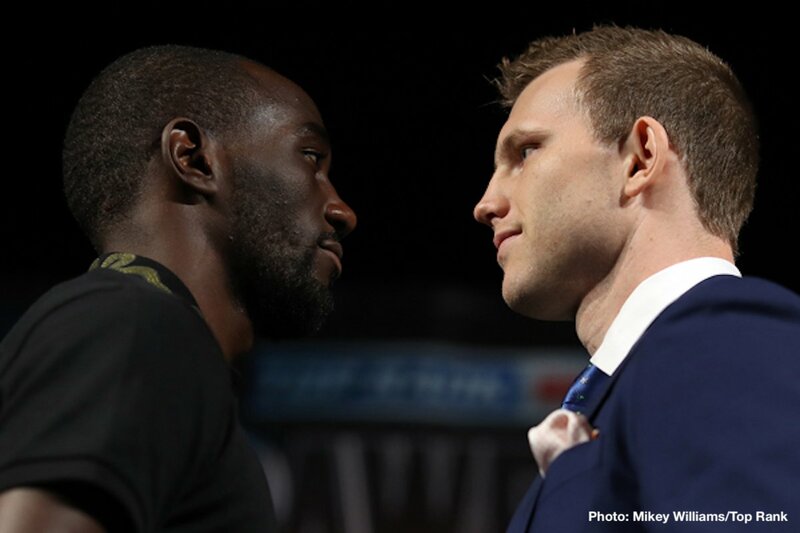 I’m looking forward to putting on a great show come Saturday night,” Crawford assured the media assembled at Las Vegas’ MGM Grand. Of course, Crawford – who fights at welterweight for the first time on Saturday as he attempts to add to the lightweight and junior welterweight world titles already on his resume – is speaking about a very specific version of Pacquiao. The Manny Pacquiao that stepped into the ring in Brisbane, Australia on 2 July last year to defend his welterweight title against Jeff Horn was a complete shell of the fighter that had once reigned as boxing’s pound-for-pound best. Pacquiao lacked timing, struggled with positioning and seemed void of the predatory instincts that had made him such a fearsome finisher in years past. The Pacquiao of old would no doubt have stopped a struggling Horn in the tenth round of their contest. Instead, Horn survived to see the final bell and secure a unanimous decision victory – and with it the WBO welterweight championship. Whilst Crawford (32-0, 23 KOs) is rightfully critical of Pacquiao’s showing against Horn, “Bud” could do far worse than attempt to mirror “Pac Man’s” own welterweight debut in back in November 2009 at the MGM Grand against then two-weight world champion Miguel Cotto. Pacquiao entered what was among the very best performances of his career that night to claim the first welterweight world title of his career, savaging Cotto for the majority of the bout – and dropping him twice – before referee Kenny Bayless mercifully stepped in to halt the contest 55 seconds into the final round. The victory cemented Pacquiao’s status as the sport’s number one fighter at the time. Crawford’s bout with Horn on Saturday takes place at the same venue and will be for the very same WBO welterweight championship. As impressive as Terence Crawford’s unbeaten professional campaign has been, he does lack a truly signature win or performance. Aside from his victory over Pacquiao, Horn (18-0-1, 12 KOs) does not have a great deal of depth on his resume. Crawford should be looking to mark his arrival in the welterweight division with an emphatic statement whilst claiming a world title in his third weight class this weekend. If he can do so, then a tantalising list of potential matchups exist to allow him the opportunity to build a lasting legacy. Indeed, for as long as Pacquiao continues to stay an active competitor, even a Crawford Vs Pacquiao fight would remain a possibility. Previous boxing news: Santa Cruz vs. Mares 2: Can Abner Change The Narrative?